Personalisierte Softwareentwicklung ist so vielfältig wie Ihre Unternehmensprozesse. Darum nehmen wir uns Zeit, Ihre täglichen Routinen und Aufgaben umfassend zu verstehen um eine optimale Prozessoptimalisierung durch Automatisierung oder Softwareentwicklung zu erreichen. Die folgende Softwareentwicklung wurde für eine Restaurantkette in den Niederlanden programmiert, um den Standard der sogenannten ‘HACCP‘ Zertifizierung zu erreichen. Die Software wurde auf VBA Basis programmiert und ist somit kompatibel auf jedem Windows Computer. Bei Bedarf ist auch eine App- oder MAC Programmierung möglich. 2) Auswahl von Pizzas, die produziert wurden. Kontaktieren Sie mich mit Ihren Wünschen der individuellen Softwareentwicklung! Vapiano, Pizza Hut, New York PizzaVapiano, Pizza Hut, New York Pizza … The list of gastronomic success examples in the franchise industry could lead further. For decades, fast food restaurants, Delivery, Food & Co. are among the most popular franchise providers. Every day there are millions of people customer – what particular degree is just where it comes to food trust. Today, customers set high standards for catering establishments in terms of quality and hygiene. Confused by the small and large food scandals of recent years look back today exactly – even during rapid consumption of burgers, pizza and sandwiches. Franchisors and franchisees is the special challenges. In each store, which offers food, day after day everything has to be top in terms of hygiene and cleanliness. If mistakes happen in a store, it can bring everyone else into disrepute. Since the introduction of EU hygiene rules for food of 2004 there are five letters especially in focus: HACCP. The concept of “hazard analysis and critical control points” is anchored in it. A detailed guide to avoid risk prevention for all, the food produce and put into circulation. For example, freshly prepared for all pizza restaurants, pizzas and baked baguettes and then interpret in a bar, a lot of attention in dealing with the durability of the respective food is required. In a HACCP system will determine which food must be thrown away after how many minutes or hours if it has not been sold in the meantime to the running or sitting clientele. 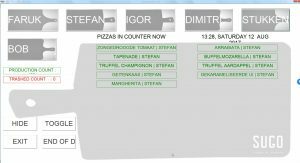 It also supports the kitchen staff also helps to identify already sold out or not in the counter existing products quickly and to manufacture them. The name of the employee, time, date and number of food produced is logged. Using the evaluation and documentation of critical situations are recorded and can be reliably optimized. HACCP is an important tool for the franchise management and ensures the protection of consumers. However, the extensive testing, evaluation and documentation process can quickly lead to red tape: For even the best CEO can not be everywhere – even if he is in charge everywhere. Avoid not be there – because violate franchise operations against the HACCP regulations, threatening serious legal consequences, including the withdrawal of the concession. Then there is the reputational damage that draws other franchisees affected comes. Luckily for modern IT applications can be harnessed as valuable aids today. Thick manuals, endless checklists and organizationally complex seminars were yesterday. Because modern software programs are now working this off in seconds. Excel Help programmed you a customized HACCP-compliant software solution at an affordable price. 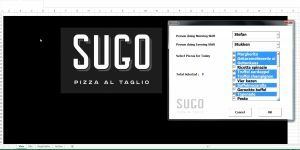 Our software is already successfully since 2016 in the operation of the pizza chain “SUGO” which operates its stores in Amsterdam and Rotterdam. Software and apps such as the popular in franchise company e-QSS be adapted exactly to the needs of each client. All criteria to be checked, will be integrated. HACCP and IFS checklists are already in the system. From the control temperature for ground beef to the special provisions for cleaning pots, pans, utensils and work tools that come directly with the food contact. An important help to avoid mistakes – as busy pilot an aircraft. Critical control points are mobile anywhere quickly checked in operation and checked off by pressing a button. If there are problems, the competent authority will be informed automatically and without loss of time – and can intervene quickly. Critical limits may be set by the system before. These correspond to the testing of not the rule, the error is automatic. All carefully compiled values ​​can be automatically converted into a documentary. Franchise owner at any time so track of where you have problems and are able to fix quickly. Who manages several franchised outlets, may draw up benchmarking systems quickly and easily. For example, branches can be compared – and improve. Over the entire HACCP process across all relevant criteria are audited using the programmed software: From the agreement of the criteria used to their regular review and documentation. The ticking off all the control points is as simple as writing an email. Thus smartphone app and can make them important helpers to keep the administrative burden in daily HACCP processes control at all times.